Ben and I were prepared for anything the other morning. We each carted along three rods - a spinning rod, a fly rod and a rod armed with a big circle hook in case we managed to catch some livebaits. We set out at 03.30 but it was about fifteen minutes too late. By the time we were ready to fish it was already well on the way to being light and we always like to start fishing more or less in the dark. The fact that it was a full moon and a very clear sky did not help much. Anyway, we began to fish. 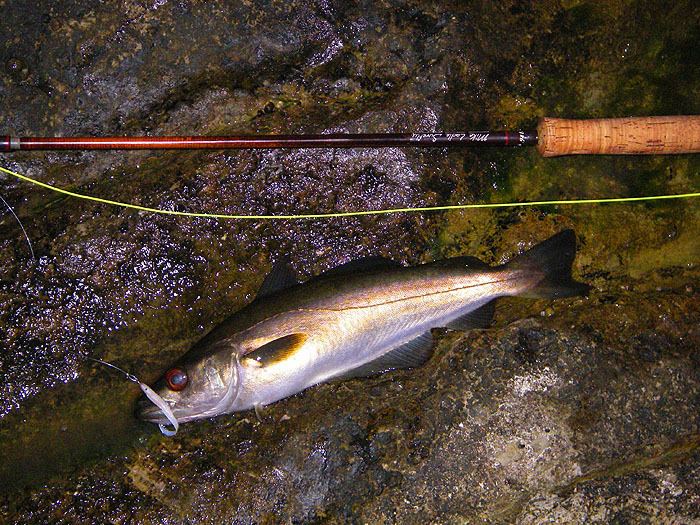 At first we both used the fly rods armed with little white rubber eels, mine was the same 'fly' that had caught palometa and lost tarpon when I was in Tobago a week or so ago. 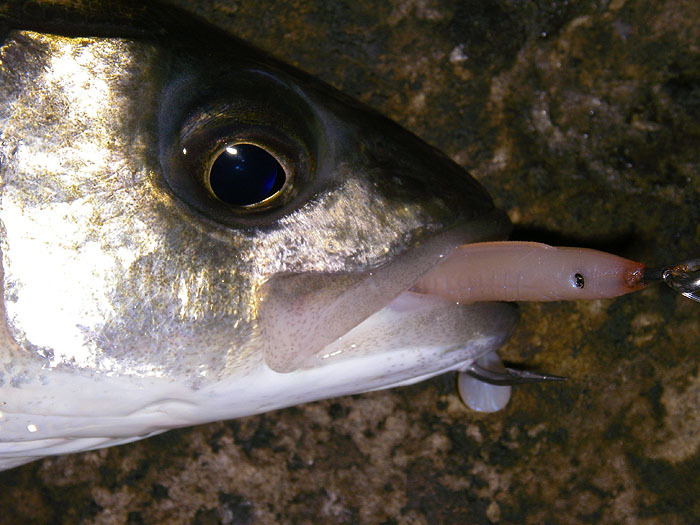 The superglued body of the eel was still as secure on the hook shank as when I'd first attached it. There was nothing doing for the first ten minutes and I was the first to 'break'. I picked up the plugging rod and made a longish cast. 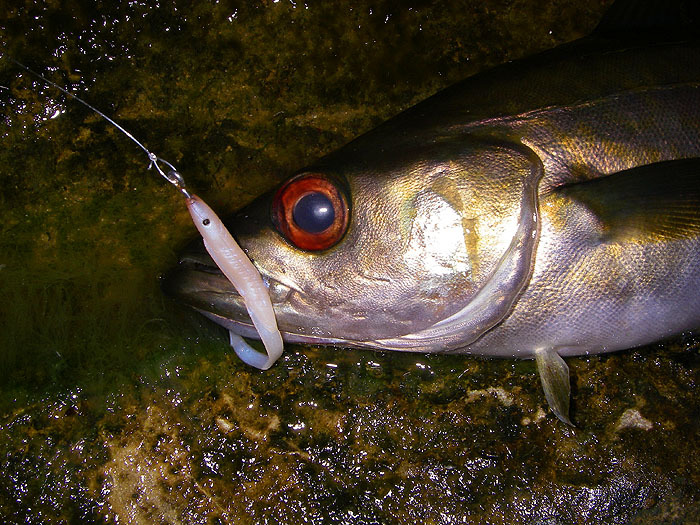 the lure seemed to be in the water for just a few seconds before the rod arched over and I was into a fish. The bass fought hard although it was not a big fish and it took a little time to bring it close and slide it ashore on a convenient wave. 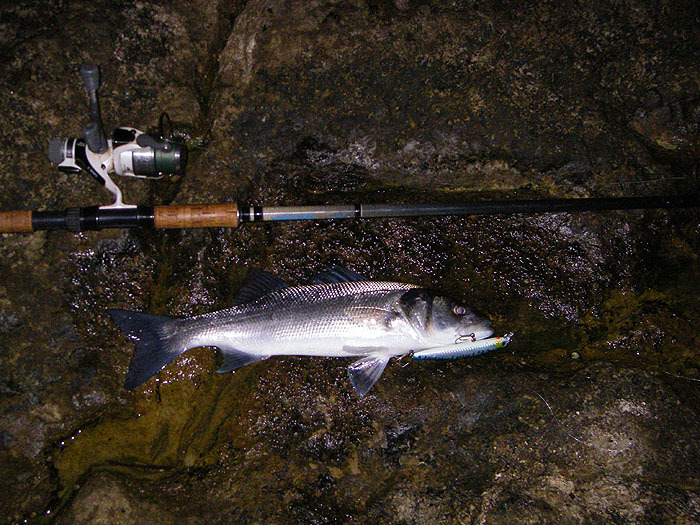 I took a couple of pictures and began to fish again, after a little while I hooked and landed a second bass. Ben was still fly fishing and shortly afterwards he caught a tiny pollack. I was going to take its picture but it came off the hook so I told him to pop it back. I picked up the fly rod again and it wasn't long before a reasonable pollack nailed the fly more or less under the rod tip. This one was actually big enough to take a bit of line in its attempts to regain the haven of the kelpy sea bed, however, it was landed, unhooked and returned. 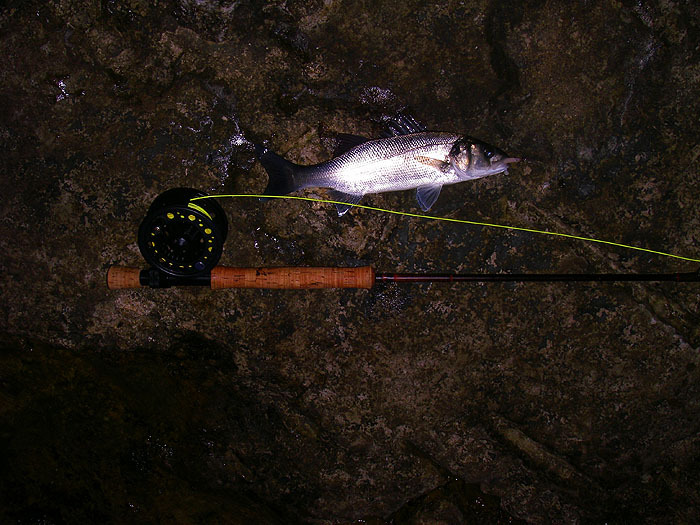 I cast the fly again and this time it was taken by a bass considerably smaller than the ones I had caught on my plug. All in all a satisfactory trip but we still await the mackerel before we can test last season's results with livebaits. Patience Mike!